What if there was a way to cut through the noise, get noticed, and make a real connection with your audience? For many businesses, on-demand audio content is the way to do just that. Podcasting is gaining in popularity, as you may have noticed, but the medium is not oversaturated. There’s still plenty of room in the market for you, so don’t worry that you’re too late to get started. It could be argued that podcasting is not right for every business. It could also be argued that blogging is not right for all businesses. Yet, if your business takes content marketing seriously, then podcasting can be a strong component of your content strategy. Here are four reasons to embrace podcasting as an integral part of your strategy. 2015 was the year podcasting made its way toward the mainstream. Edison Research has reported that one-third of all Americans 12 years of age and older have listened to at least one podcast. If there are still two-thirds of the population remaining who haven’t explored podcasts yet, then there are lots of new ears to reach. The best time to start a podcast was four years ago. The second best time is now. The sheer number of people listening to podcasts — and the even greater number of people still to discover the medium — makes podcasting an essential part of any content strategy. With new cars starting to roll off the assembly line with podcast players installed in them, and both Google Play and Spotify getting into the podcast distribution game, podcasting is just getting started. As of today, the potential reach of a podcast makes it enticing, but the part that should really excite you is the wave of new listeners still to catch the podcasting bug. That’s when podcasting will officially live in the mainstream. Podcasting is a great way to test new ideas. Simply hit record and talk. When you find a topic or angle that resonates with your listeners, you can easily turn it into an article, report, or ebook. Podcasting can even make you a better writer. The technology that we have at our disposal enables anyone with a laptop and a $100 microphone to start their own radio show. Don’t overthink it, and don’t worry about hating the sound of your own voice when it’s recorded — we all have that problem. Even if you understand the importance and value of creating a content library, you may be wondering how you will produce all the content to fill your library. It’s quite simple when you have a podcast strategy that attracts attention and builds your content arsenal. Call an expert in your field and interview him or her via Skype. Get your audio transcribed and turn the transcriptions into an ebook or ebook series. Record audio versions of your most popular blog posts. Podcasts help you create unique and valuable content. Each of these three ideas above could easily be created and added to your content library. Your audience would love it. Podcasting can be used to cast a wider net for your business and bring more people to the top of your marketing funnel. This is essential for all content marketing strategies. Audio content, unlike written content, can be consumed during commutes, showers, walks, and while at the gym. You have multiple opportunities to reach out to new customers where and when they want to be reached. Even your biggest fans won’t be able to read or listen to everything you create. This is why it’s essential to create content that can be distributed across multiple mediums. Those who listen to your podcast may not read your blog, and those who read your blog may not listen to your podcast. So, create within both mediums and go where your audience already is. Podcasting is an excellent opportunity for you to repurpose your work and find your audience where they are. 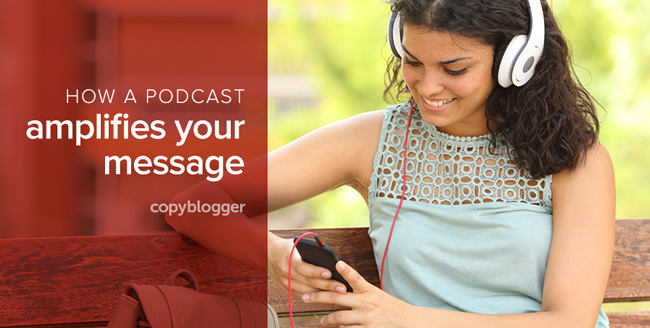 You may fear it’s too difficult or too much work to add a podcast to your content strategy. Although creating a podcast is not easy, it can be simple. A lot of work, yes. But the potential rewards far outweigh any drawbacks that might concern you. Including a podcast in your content strategy could even make your life easier, not cause the burden of more content to create. If you want to expand your reach, the ease of creation, ability to test ideas quickly, and added value of audio content in your content library make podcasting a no-brainer addition to a robust content strategy. Get Your Free, No-Frills, 9-Step Showrunner’s Guide … Today! If you want to take the next step to develop, launch, or run your remarkable podcast, start with The Beginner’s Guide to Launching a Remarkable Podcast. The free ebook is a guide to getting your podcast off the ground. It follows the framework mapped out inside The Showrunner Podcasting Course. Yet, at the same time, it is a standalone guide to getting started today. I love podcasting both as a consumer and content creator. For years I’ve used it as my Continuing Education time while doing chores and running errands. No other medium outside of audio allows you to drive and operate heavy machinery while consuming it! The reason I eventually got into creating one myself was because my target audience is kids and their families. The number of children who struggle with reading is too high, but why should I wait until they get better before allowing them access to my content? The same thing could be said for, what, half the adult male population of America? I know the top podcaster for podcasters doesn’t enjoy reading much, not even emails, but has a huge business because life (sorry Demian) isn’t all about the written word. Cheri, I fully agree podcasts are a great way to learn and be entertained while you are doing other tasks. As for reaching kids and their families, I see podcasting as an excellent tool. Modern families spend a lot of time together in vehicles commuting, so I see this as a great time to join them with your message. I find podcasting helps me to stretch and thoroughly explore the material, often resulting in new ideas and fresh perspectives. Jeff, you are so right! I love to use podcasting to get my head around new ideas and test them on my audience. If you are anything like me, you will never run out of things to talk about, but staring at that blank page sometimes can be frustrating. I often start with audio and then repurpose those ideas into text for my blog. I have always loved podcasts and feel they are still highly underutilized. But they are slowly catching on. There are two parts that are difficult with podcasting. Getting it all set up the first time. Getting that first episode up takes some time. From there its pretty easy once everything is set up. Once you have it set up the next difficult part is committing to it. Its one of those things that’s easy to quit after a couple of episodes. Choose a schedule and stick to it. Even if its minimal something like once a month its a start. As you get the process down you expand it and up the amount of episodes that you do. Nobody is saying podcast is easy, but as you say, they are underutilized and that leaves a huge potential for those of us who are podcasting. And 100% stay consistent, as you say. There is no better way to grow your podcast. In my view this content strategy is not workout for the SEO. I am not an SEO expert, so I cannot speak on the nuances of SEO. But in my experience, posting podcast episodes consistently is looked upon favorably by search engines. Jon, this was such a great post. I’ve listened to your podcast for a while but this is the first time I’ve read an article by you. Again, great stuff. This is an inspiring article thank you. I am encouraging our team to begin podcasting and am going to share your article today! Can you recommend a few getting started in podcasting articles? I think I will make some progress if I can demonstrate how we can actually do this. Podcasting should definitely be a part of your content marketing plan. The simplest way to get your team onboard is to download our new report The Beginner’s Guide to Launching a Remarkable Podcast. It’s free and will have you up and running in no time. After you read that, feel free to ask me follow-up questions on here or Twitter. I’d be happy to help.